I have very rarely bought a school photograph featuring my children. This is in part because someone is always looking the wrong way, or, more recently, that, thanks to visits from the tooth fairy, one or other of them is gurning particularly unattractively. I did, at one point in their infancy, investigate the possibility of making some money out of them through child modelling, being , as I am, convinced that my children are way more attractive than anyone else’s in this universe and beyond, and was all set to go until I saw the fatal caveat, ‘must be able to take instruction’. Ah. That’s not my raggle taggle bunch, then. This was one of my many failed attempts to get a family shot. I took up a special offer of a photo session at home once (I don’t remember how I got it, I’m not usually the one who benefits from such things, being far too half-soaked to sign up for the right thing at the right time). The poor young photographer left my house with his hair sticking up and a slightly manic expression in his eye. I think this was because he had a fixed idea of the kind of image he wanted. His idea was to ask the children to pose, and, as in those school photographs, it didn’t quite work. I’m not a great fan of school pictures in general though, it has to be said. All those fake skies or fake libraries, and the way the children sit there, stiff and puppet-placed; hardly a reflection of the people they are at all. My favourites are the ones where my children, rather than sitting on the ubiquitous furry rug, have been photographed doing what they do best, being themselves; so when I stumbled upon a photography studio, a national chain that take the very kind of pictures I love, in a local shopping centre, touting seriously reduced-in-price sittings, I jumped at the chance. It was great fun. We pranced around in a white room, and the children positively glowed from all that attention. The problem was choosing the images we liked the best. There we were, in a miniature cinema, with beautiful pictures of our beloved progeny massively projected onto the wall, with a sound-drop guaranteed to pull the heartstrings. It was almost impossible to resist re-mortgaging the house. It was overwhelming; from being so disappointed in the group pictures we’d been offered before, there were more lovely image than I could shake a forest of sticks at. The only way to do it was through a process of elimination. The first ones to go were the ones that highlighted Sam’s Down Syndrome. Don’t get me wrong, I have no axe to grind there, but I don’t want, either in a picture or in any other situation, those pesky chromosomes to be the first thing I, or anyone else, notices about him. Second: any picture that made the husband look bald. Which is a great shame, because possibly one of the very best photos taken of me, like, ever, did exactly that. Next, any pictures that made the children look like they were in a catalogue, which, considering we had taken some toys in with us for them to play with, was surprisingly un-difficult. Eventually, we had it down to nine or ten. It’s at this point in proceedings that salespeople generally get shirty. We can’t afford to spend the sort of money that people do who cover their walls with enormous portraits because they just can’t decide, so when it becomes clear that we are not going to sign a blank cheque or take out a credit agreement, they want us to make up our minds pretty sharpish and get out of the door. They start offering helpful suggestions, their opinions on which images work well and what would look great on my walls. One of the pictures that our salesman especially liked was an undeniably beautiful shot of the three children playing together. L was lying on top of A, her wild mop of hair dangling over her brother, the pair of them looking like two peas in a pod. By their side, giggling with glee, was their elder brother. All three of them were looking directly at the camera. All three of them were showing their best sides. We all agreed what a great picture it was Except I couldn’t live with it. I couldn’t have that image on my walls, there for all to see. Because for me, a picture isn’t just a picture. I’m no artist, and I have no training in art appreciation, other than Sister Wendy and a good few years teaching The Tudors as a topic. 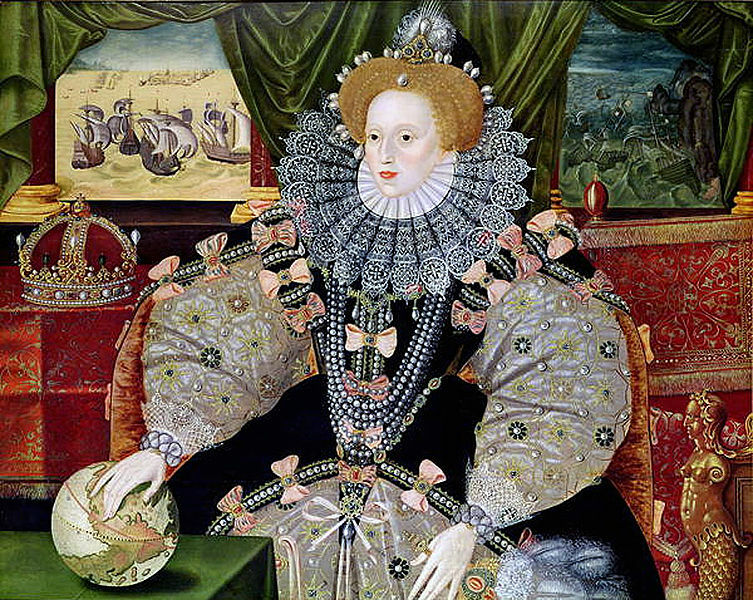 There they are, those great paintings of Henry VIII and Elizabeth I, strutting their royalty, their rule over land and sea; great and beautiful portraits, but at the same time, anything but. These are no naturalistic images, and yet their function is the same. They, rather than telling a story of family, tell a story of power. And the story of that picture, that lovely image of my three beautiful children told a tale that I know is true, but that I don’t want to become the canon of my family. As they grow older Sam will, I know, take a different path to the two of them. His feet are already on that road. But it’s like those days when I accidently dress in the same clothes as my children (I know, I know, I don’t mean the exact same clothes). I wouldn’t want a photograph on my walls of that either. They are not mini-mes, their future irrevocably tied to my own. So I don’t want them to look at a picture on the wall every day, a picture that tells a story of a relationship they are too young to fully understand. I want them to be who they are, unfettered by expectation. Uncluttered by a story they have not yet told themselves. One of the most gob-smacking things a child ever said to me was, ‘I can’t do that, Miss. I’ve got ADHD.’ After I’d picked my jaw up from the floor and recomposed my features from inappropriate-laugh-in-your-face-ness to serious school-marm, I tutted, told him I’d never heard anything more ridiculous in my life, and sent him on his way, the proverbial flea well and truly in his ear. As he bounced back to his seat (via the long-way-round rather than the one-way-system) I wondered quite how many times he had been allowed, in his nine or ten years of life, to get away with the same protestation, because that sort of thing just doesn’t wash with me. You see, I am used to expecting the super-human from super-human small people. I have never been satisfied with ‘I can’t do that’. I have long been of the view that, even though children carry labels that speak of limitations, even though my child bears one of these labels, the world, as my dad was fond of intoning to my disappearing teenaged back, does not owe him a living. I cannot do the learning for him. In the end, he will have to do it for himself, or forever flounder in an artificial infancy. This is not to say that I haven’t made adjustments for the children with special needs in my classrooms over the years. Time, angled writing boards, footplates, attention, sticker charts and books, differentiated activities; all these things have been, and are, part of my armoury. I understand. I understand that the journey into learning is harder for some than for others. I sympathise. I wish it wasn’t so. If I could wish away the difficulty, if I could wave my magic wand over it and wash it away I would, in a heartbeat. But underneath the sympathy is a steely determination. A determination to see these kids, and my own, succeed, whatever the label. Whatever the obstacle. I remember one young boy, years ago. He had problems with short term memory and dyslexia. He and I had a chat one day about it. He never asked for special treatment. I never gave him any. I just said to him that he needed to find his own way to remember things and he was just going to have to work harder at that. We shrugged our shoulders in acceptance and got on with the job. Later in the year I gave him the starring role in our class assembly (one of those teacher written plays, the sort with parts for everyone). He volunteered. I thought he would do a good job. When he left that school I was touched that he mentioned that role, that assembly, as his best moment in primary school. We knew it was hard. But we also knew that I was cheering him on all the way. And I took the lessons that little boy taught me with me when my own little boy was born. Breastfeed? Get on it. Sleep through the night? You betcha. Potty training? Why the heck not? And what about all the other things – communication, tantrums, getting dressed, getting undressed, riding bikes, reading, writing, figuring out those bleddy coins and how much they’re worth? What about them? They need to be learned, to be conquered too. Just because a child has Down Syndrome, or Autism, or dyslexia or dyspraxia or ADHD or any of those other things, it doesn’t give him a Get Out Of Jail Free Card. Eventually, on with Life he will have to get. This doesn’t mean that I don’t find it hard, that he doesn’t find it hard. This doesn’t mean that we haven’t had our days of throwing ourselves to the floor and shrieking at the unfairness of it all. It is hard. It is bloody hard. But, after I have had my moments of not-quite-despair, I pick myself up, pick him up, take hold of his metaphorical hand, and on we go. For I am driven by a moral imperative. Just because something is hard does not mean that it isn’t the right thing to do. So if you find yourself working with me, either child or adult, don’t come to me saying, ‘I can’t do that, it doesn’t work,’ or, ‘ It’s too hard’. Together we can find a way. We can take that label, ADHD, Down Syndrome, Challenging Child, Challenging School, Pushy Parent, whatever it is, and we can give it our best shot. We might not do it the conventional way. It might take a while before the results of our labours start to show, and be warned, it will require extra effort on all our parts. For me, anything else is writing people off. Anything else is just excuses. I was on my way to Tesco the other day with Sam, when somebody stopped me, and reminded me of how cross I used to be, pretty much all the time. Sam likes to make me walk on the other side of the road to him (I don’t think he’s embarrassed by me – yet – after all, I don’t ‘cooee’ or anything , he just likes to stretch the apron strings a little bit at a time), and the sight of a medium-sized child with Down Syndrome out on his own in the late afternoon/early evening caused a passer-by to do a double take. I always notice when someone stares at my son. When he was little he was so utterly gorgeous (fluffy red hair, long eyelashes, flirty eye contact and captivating grin) that I accepted people’s admiring glances as nothing more than his, and my right, but as he’s grown older, and his Down Syndrome has become more noticeable, the stares have become less admiring, more curious and longer in general. It doesn’t happen here, in our home town, too much, I have to say, and when it does, it’s usually from little ones, who are easily reassured by the big smile from me; I think it’s in part because Sam is so well known round here. We walk everywhere, we shop locally in our disorganised fashion, he went, and goes to a local school. But this stare was different. It wasn’t like the old lady in Sidmouth who goggled at him in such a way that her head nearly screwed off her neck. I was tempted to ask if she’d never seen anyone with red hair before. Maybe it was because Sam was dragging far behind the rest of us, kicking at stones and generally moaning about having to walk instead of riding in the car. I hope it was, because even though Down Syndrome is getting rarer and rarer, he’s hardly a unicorn. Maybe old ladies in Sidmouth are richer than most people and that gives them a license to be rude, I don’t know. No, the way that this man stared at Sam had my hackles raised in an instant. I’m a distrustful sort where my children are concerned, I freely admit, but there was something about the way he looked at my son, as if he was a monkey in a zoo, that put me on my guard. Even so, I was mildly surprised by his first comment to me. “Is he yours?” I’d love to have the chutzpah to answer, “No, I go for walks to Tesco all the time with random children,” but I didn’t. I have learned, over the years, to hold my tongue and give them a non-committal smile. Most people, after all, mean to be kind. And I suppose it’s not completely unnatural for a man of his generation to question whether or not the child with Down Syndrome with me was my child or not. When I was on the maternity ward the question of adoption was raised,and dropped pretty damned quickly. It used to be far more common that parents would give away the children who didn’t measure up: put them in a home, hide them away, move on as quickly as possible. Even so, it would be easier, perhaps, if he was less of a small version of his father and looked a little more like me. Something of my defensiveness must have communicated itself, though. Maybe I’m not as good at hiding what I think, after all. After thirteen years of fielding comments from the ubiquitous ‘did you know?’ (accompanied by sympathetic head-tilt) (yes, I ordered him from the ‘I want a more complicated life baby shop’ especially), through ‘Down’s children don’t get nits’ (why is that? Are you implying that he’s never going to have any friends? ), and my own personal favourite, ‘He’ll always be with you’ (please, no! ), maybe my non-committal smile was more of a gritted-teeth grimace. Whatever it was, he seemed to feel the need to reassure me. ‘You know what I think?’ he said. ‘They are angels. Angels sent from heaven.’ Oh purrrrleeeeeeease! Anyone who has spent any time in the company of my eldest son will know that he is no angel, disguise or otherwise. He has just as much capacity for devilment as anyone else. You should see the way he winds up his younger brother. I feel quite sorry for A sometimes. And this idea that people with Down’s have ‘such capacity to love’, as if they are more loving than anyone else. I’ve got a theory about this one, and it’s got nothing to do with an extra chromosome. I mean, if you were stuck in a home, looked after by people who see you as a patient, where you are just one of many to be treated in your shift, you’d be pretty pleased when someone showed you a bit of loving attention, wouldn’t you? And I don’t for one moment think that those children who were placed in the sanatoriums of the past had a better time of it than the adults living in the Winterbourne home. That’s one of the reasons I hate these kinds of comments. Sam may be an affectionate child, he may be trusting and impulsive, and many, many of the things he is may well fit into a stereotype. But by describing him this way, by putting the label before the person, by assuming that all ‘Down’s Syndrome’ children, or adults, come to that, are the same, we lock them away just as effectively as if we had put them in a dungeon and thrown away the key. In just the same way that I want freedom for my daughter to choose who she wants to be, what job she wants to do, how she wants to live her life, I want it for my sons. I want it for them, regardless of their chromosomes, X,Y or 21. So don’t call my son an angel. Don’t assume that he won’t read, walk, talk, get a job, have a home, make successful adult relationships. Don’t assume anything. Don’t put my baby in a corner. This post is dedicated to the unsurpassed Aunty Mabel, her marvellous dog Pippin and the makers of the wonderful ‘Come Outside’. I would like to point out that, although I have been inspired by the title of one of the episodes, none of us got stuck in a cupboard, there was no fire, and no-one had to call in the emergency services. I would also like to say that, although ‘Useful Holes’ is the best title ever, the one about the toilets and the song about sewage is my favourite. I was often asked, when my children were littler, which one of them I found the most difficult to handle. The expectation was usually, by their glances and expressions, that I would say Sam, and there was always surprise when I pointed my own eyes to my middle son. This is not to diss A in any way whatsoever, but an acknowledgement that he is a far more complicated child than his brother; where Sam is (generally) happy-go-lucky and laid back, A has a tendency to be anxious and nervy, a child who knows-too-much, a voraciously curious sort, always getting stuck in the bin or falling out of the front door when he was a baby. Mind you, Sam isn’t exactly a piece of cake either. Difficulties generally arise when we attempt to get him to do something he doesn’t want to. 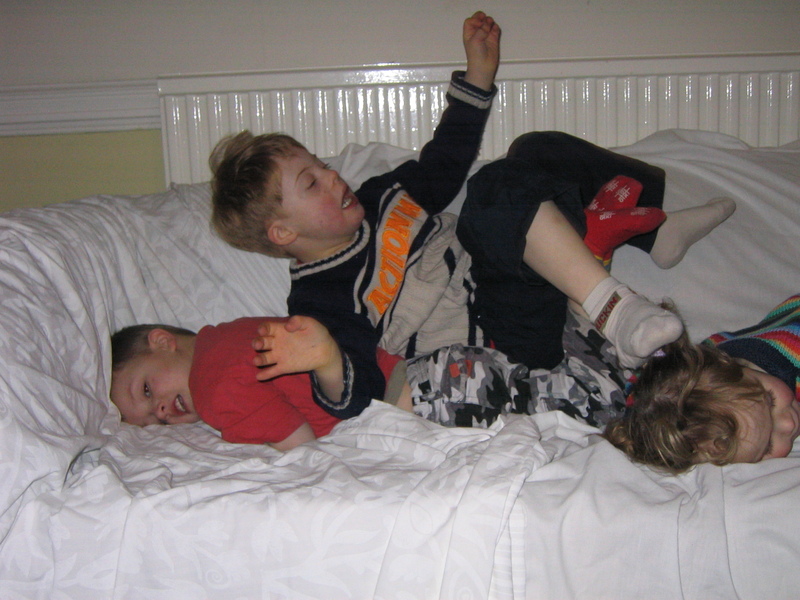 For a long while, when we were going through a bad patch with school, getting Sam up the road was a major undertaking. I would arrive in the playground, just in time, with Sam, small A and baby L in the pushchair and people would nod and smile at me and say things like, ‘you’re always so calm’ and I would think I AM NOWHERE NEAR CALM! YOU SHOULD HAVE SEEN ME TEN MINUTES AGO WHEN HE REFUSED TO PUT ON HIS SHOES! There were many days when Sam must have been glad to get to school just to get away from me, Cross Mummy. When he was little I used charts to great effect in order to help with the thorny problem of getting Sam first into bed, and then to stay in bed. As a baby he was a great sleeper, but when he was two he endured a long-ish stay in hospital and upon his homecoming, we found that his sleep patterns had completely gone to pot. We couldn’t leave him in his bed to fall asleep on his own (he would follow us downstairs), and getting back to sleep after waking proved impossible. So I broke the issue of sleep-at-bedtime into three simple steps, made a chart, gave him a smiley face (or not) for each step, and three smileys meant a reward of some sort. It took a little while, but it worked. In the final analysis, what I was doing was bribing him, but guess what? We have a son who goes to bed, stays in bed and stays asleep, and we have had him for some years. Nowadays I leave the making of charts and giving of stickers to the school. I willingly back them up when they consistently reward him for getting on and doing what he supposed to be doing, by pinning them up to the wall and religiously filling the pot up with Lego. We’ve been at it for eighteen months and guess what? We got a letter from said school only yesterday congratulating him on being awarded a quite astonishing number of marbles (platinum level, no less) for good behaviour. I was once told by the best TA I have ever worked with, upon leaving the temporary job I had secured and moving on to another temporary job, ‘when I first met you I thought you were mad. But it works. It really does.’ I didn’t have to get too sneaky with that class, even. All I did was draw up a couple of charts for a couple of children with targets like Positive Mental Attitude and No Strops and we were away. I didn’t have to bend my mind too much to find that what worked for them was a relentlessly positive attitude of you-can-do-it-ness and an acknowledgement that children, even 21st century ones, like rubbing the board clean and staying behind to have a little bit of a chat with their teacher. The sneaky-ness I employed to get them to come along with me on an interesting journey into English and Maths was nothing compared to what I regularly employ at home. The thing is, I don’t want to go through the whole rigmarole of chart ticking and stickers and smiley faces and prizes in order to get Sam to do simple things at home like come to the table, put on his shoes or go upstairs to clean his teeth. At home, I am consumed by all the household mothering tasks that make the use of charts a tarradiddle when I haven’t got any time and a million other things I need to do and I’m tired and grumpy. I, for my sins, just want him to do what I ask without too much drama. Now, one of the things that interests Sam is holes. Holes in trouser knees, holes in bags, holes in paper and card, holes in the corner of the kitchen chair covers (I’ll replace them when the children stop dropping their food all over them), the list is long. He’s fascinated by them. Maybe it’s the idea that there is some sort of dramatic story behind the hole – someone must have fallen over, there must have been plasters, that sort of thing. Whatever it is, if you are wearing something with a hole in it, Sam will be drawn to you like a moth to a flame. A bit like the way A was transfixed by my bad toe. The other part of this little story is the fact that my husband very rarely wears anything that isn’t either battered in some way, or is full of holes, particularly his socks. Which is great for getting a reluctant Sam up the stairs. We love going to Center Parcs. For my husband and me, it represents a reminder of the first real break we had from the responsibility of parenthood. For our children, it means exciting freedom, a chance to discover new things and time to play with parents who, for the duration of the stay, are released from the cares of providing breakfast, lunch, tea and doing the laundry. It also helps that it is not too far to travel from our home, as L is sick at least twice on the way there and once on the way back without fail. For us all, there is the familiarity of several years of short breaks that brings relaxation in itself. Sam, particularly, suffers from the stress of the unknown. We have had several camping holidays and we have always returned home with a palpable sense of relief, not just because camping with children is a lot of hard work, but because Sam’s anxiety leads to sleeplessness, which in turn leads to the rest of us feeling wrecked and bad tempered. Which is kind of par for the course for families on holiday, but one would like to try to avoid it if one possibly can. One of the things I particularly like is the break from wrestling everyone in and out of the car several times each day. Instead, as a family, we enthusiastically embrace the bicycle. 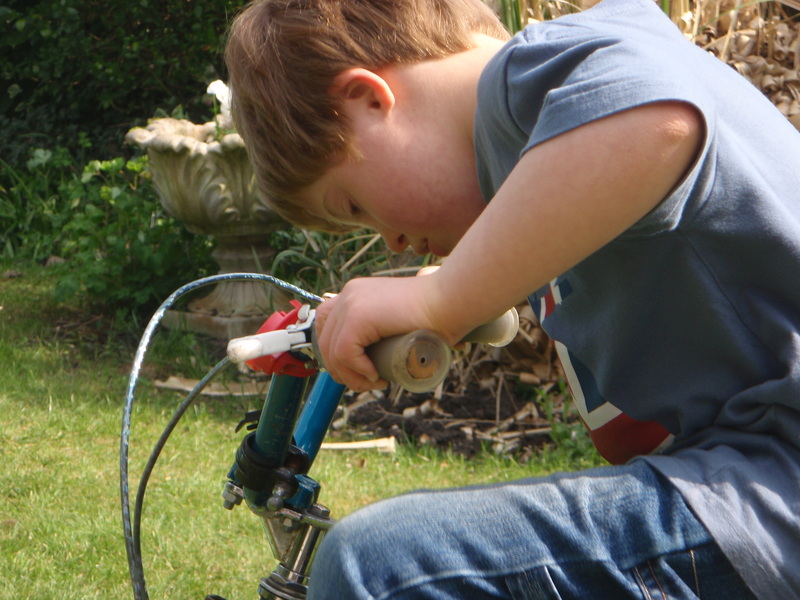 Riding a bike has always been one of the key skills that we were keen for Sam to master. I was more than happy to leave this one to Daddy (having a baby around kind of gets in the way of running behind a bike), and, all credit to him, Sam was pretty much riding by the time he was six. Riding at a pace slower than walking, mind you, and more often than not, due to our familial desire to actually get to place,s attached to a tagalong, but riding nevertheless. Unfortunately, the acquisition of such life skills has the effect of leading me into a bad case of overconfidence. Of course, go mountain biking, said I to beloved husband. I will collect the children from their activity. Sam and A can ride or push their bikes and I will take L on the seat on the back of my bike. No problem. I didn’t reckon on the tow bar obsession rearing its ugly head, and I didn’t think that Sam would take such offence at being asked to transport himself without support. I didn’t think that he would throw his little bike down in a temper, leaving me, with a baby in a bike seat, unable to do anything to stop him, or, not having three arms, to help. What had seemed like a simple exercise rapidly spiralled out of control. I found that hills, babies, bikes, bags, boys and temper just don’t mix. I realised (eventually) that we weren’t going anywhere fast, and, even though I was thankful that A wasn’t doing what he normally did by riding off into the sunset, full of the confidence borne of living for four years, I did what many of us do when faced with circumstances that have got way out of our hands; I prayed. Now, I don’t know what your religious convictions are, and mine aren’t the subject of this blog, but at that moment I know that I prayed the desperate kind of prayer that goes straight to the heart of God. I was filled with the instant conviction that, somehow, my, ‘Help me!’ had been heard, and that help was on its way. Now, the funny thing about help is that I like it the way I like it, if you know what I mean. Having lived a long way from my parents and any sort of family support for the vast majority of my parenting life, I have got used to being self-reliant. So, when someone stopped me and asked if they could help my first reaction was not to fall gratefully at their feet. Instead, my experience with Sam’s tantrums led me to shake my head, firm in my belief that it would soon be over. It took three offers of help before I cottoned on to the fact that it wasn’t coming in the form I had hoped for. All I wanted was for Sam to stop shouting and do what I wanted him to, and it took me a while to realise that wasn’t going to happen. We had struggled along together, with me alternating between encouragement and increasingly desperate begging my child to at least push his bike along if he didn’t want to ride it, until we reached the bottom of The Crazy Hill. At the top was our chalet, rest and safety, but in between there was an enormous obstacle. As I stood at the bottom of a long, winding path that led up a steep hill, alone and responsible for three small children, one of whom was having a major rebellion, I knew, with that strange clarity that hits you in these situations that, not only was I struggling with a present problem, but I was faced with a metaphorical mountain too. That moment of clarity showed me that I might know where I was going, or more properly, I knew where I wanted to go, but that I had run out of ideas. I knew where I wanted my lovely eldest boy to be, I knew the steps he had to take, but for the life of me, I couldn’t see how I, even with all my drive and passion, all my ingenuity and creativity, could get him there, and certainly not with a lively younger brother snapping at his heels and a baby sister permanently attached to my apron strings. I had no idea of how I was going to get from here, at the bottom, to there at the top. It wasn’t as if I was Hercules, with all the strength in the world to push that boulder up. My hands were tied. So the third time someone stopped me and asked if I needed help I burst into tears and said, ‘Yes’. I never had myself pegged as a particularly proud person. After all, as a primary school teacher I regularly humiliate myself with fancy dress or by standing in front of grown adults reciting something ridiculous or crawling about on the floor. My piano playing in concerts has often borne a striking resemblance to Les Dawson. So why was accepting help so damned hard? I learned that day that to accept the offer of help from someone, in this case a total stranger, did not constitute a failure on my part. It didn’t mean that I sucked as a mother and it didn’t mean that I couldn’t cope. It just meant that there are times in your life when it takes more than just one person to raise a child, and that’s OK. I can’t supply every need my children have – and neither should I have to. It’s OK to let other people play their part. And I found out that the act of helping me, or helping Sam, blesses other people too. It’s not our thanks that does it; it’s the act of helping that gives other people pleasure and purpose. In their act of giving, they are strengthened by my weakness. My husband tells me that I am a bit like the man in the joke who prays to be saved from drowning and refuses the rope, the lifeboat and the rubber ring because he is looking for a different kind of rescue. I’m glad that I accepted the helping hand when I did, because the stranger who helped me didn’t only see us to the top of the hill. He took us right back to our front door, and his mere presence took the wind right out of Sam’s sails. For me, that day, I was in the presence of an angel.